Our Head of Research is a CFA charterholder, and other analysts are candidates in the CFA Program. The globally recognized CFA® designation is the gold standard in the investment management profession. We believe that lasting partnerships must rely on honesty and openness between partners. We don't play games. We will admit if we don't know or understand something, but we will always work hard to close gaps in our knowledge. We adhere to the CFA Institute's Code of Ethics and Standards of Professional Conduct. We operate in Moldova – the lowest cost European country, thus we can offer competitive pricing on our outsourcing services without sacrificing quality. We have worked on numerous private companies and public stocks from a wide number of sectors: Basic materials, Capital goods, Consumer goods, Energy (Oil & Gas, alternative energy), Healthcare, Services, Technology (including hi-tech, biotech, IT), Transportation and others. We have analyzed and valued both publicly traded and privately held companies, including startups. The public stocks typically have market capitalisation between $50 million and $5 billion trading on NYSE, NASDAQ, OTCBB, AMEX, TSX, LSE, Euronext. Our equity research analysts are fluent in several languages: English, Russian and Romanian, while French inputs can also be analysed. We offer a wide range of equity research outsourcing products to suit the needs of our customers. Note that we do not demand credit for products created by us (only payment), and you will retain full rights to any work we do for you (as long as it has been fully paid). You will own the copyright and we will not distribute the work to anyone else. We will maintain full confidentiality (we recognize that outsourcing may be a sensitive issue to some customers). Moreover, our pricing is very flexible as we consider each client’s circumstances on an individual basis. We have extensive experience working with private equity investors, including VCs. Our services include investment reports with financial models and valuation, and investment memorandums. We analyze both startups and established businesses, and these can be both in developed countries and in emerging markets. We offer a wide range of equity research outsourcing services, from support tasks to writing complete equity research reports with valuation. 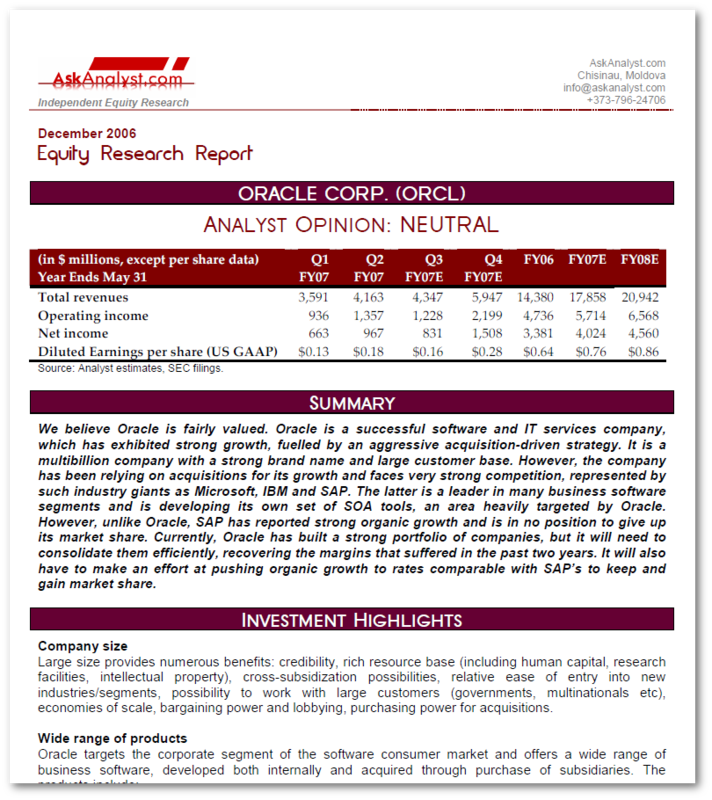 Our typical equity research report spans 20-30 pages and contains detailed analysis of a stock. We also fill historical models, gather data and do other research assignments for our customers. 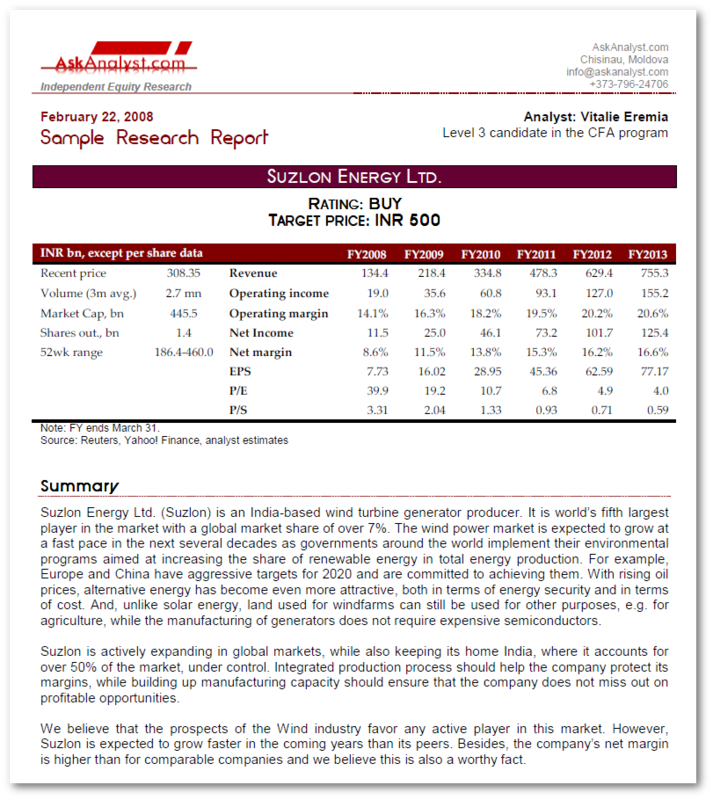 Market/industry research is an integral part of equity research and valuation and we regularly research various markets for our equity research reports. We perform in-depth market research. Note that this is secondary web-based research, using publicly available information from various sources. We always include the sources we use, so you can always verify where the information comes from. We use Microsoft Excel extensively in our work to analyse companies, value them, build tables and charts for reports and presentations and for internal needs. With this expertise, we can offer you a wide range of services involving the use of the powerful spreadsheet package that Excel represents. We regularly sift through SEC filings, press releases and other documents in search for important information. Importantly, our financial background and experience allow us to execute such tasks thoughtfully, understanding what we’re doing and not simply executing work mechanically like robots. We also usually know where to look for particular data. We are also efficient at importing data into Excel from PDF files. 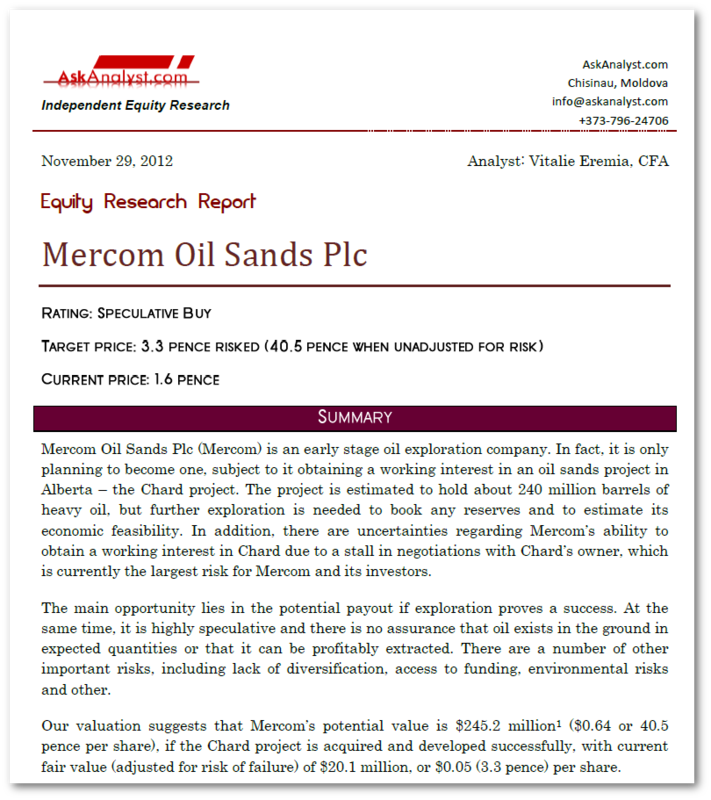 Individual equity research analysts looking for help with high workload. Companies in need of professionally-written investment memorandums or valuation reports for fundraising purposes. Investors analyzing opportunities to invest in private equity. A couple of large North American funds use our services to build historical financial models of listed companies. We offer a comprehensive set of financial outsourcing products to suit every client’s needs. Moreover, our pricing is very flexible as we consider each client’s circumstances on an individual basis. We have worked on UpWork (formerly Elance) since 2008 and have built a very good reputation. We are a Top-Rated Agency with 100% Job Success rate. Below you can see our reputation profile from Elance before it was merged into UpWork. You can access our UpWork profile here. Excellent results as usual. AskAnalyst always comes through and does first rate work at an extremely reasonable price. AskAnalyst's team has done a great job building a few financial models of listed small cap companies. The turnaround was fast. The communication on deadlines and issues is very transparent and professional. Analysts are very efficient in their desk research and the models they build are almost 100% perfect. I would highly recommend this freelancer. Vitalie and his AskAnalyst team were very professional, and completed the task well within the schedule and budget. In particular, they were meticulous in making notes of where the numbers come from, any irregularities and how they treated them, which is very important for valuation. Thanks and we hope to work with them long-term. Job well done and very fast turnaround as usual. Work was great, very efficient, accurate, precise, thoughtful, proactive, timely. Very happy. Will definitely use again. I will definitely use Vitalie again. Very easy to work with, very patient and does fantastic work! Thank you. An excellent analyst; knows his subject very well and exceeds expectations. Easy to work with and goes the extra mile to get things done correctly! Great guy to work with. 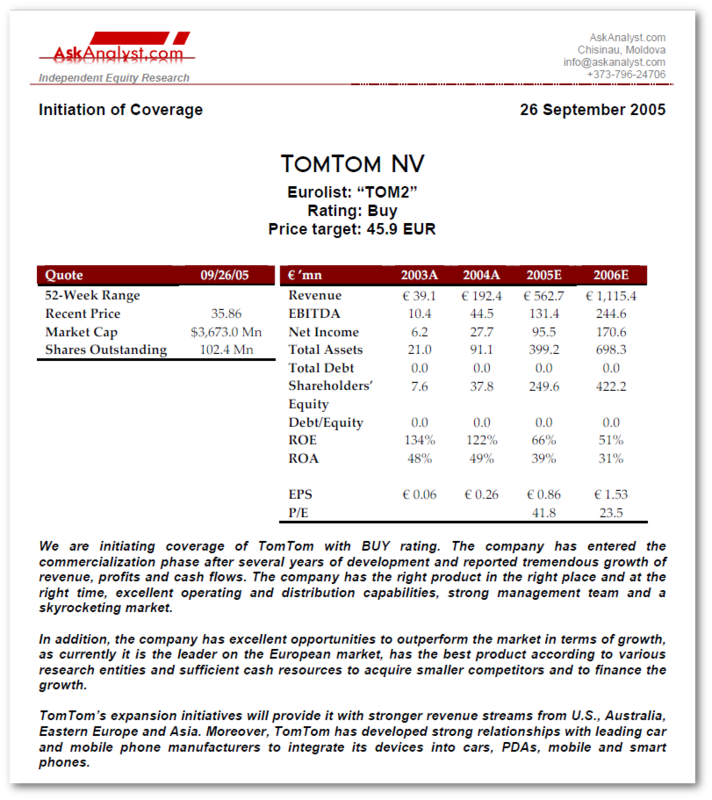 Very smart and unlike many others really understands corporate finance and in this case bank finance. He found errors in an investor's model and made us look really smart. He is a among the best we have found. Working with AskAnalyst was a very professional experience. He was prompt to respond to my inquiries and patient with explaining matters which were beyond my knowledge. An expert at his craft, I continue to work with him on other projects. Projects include financial modeling, report editing, data search, verification, etc. 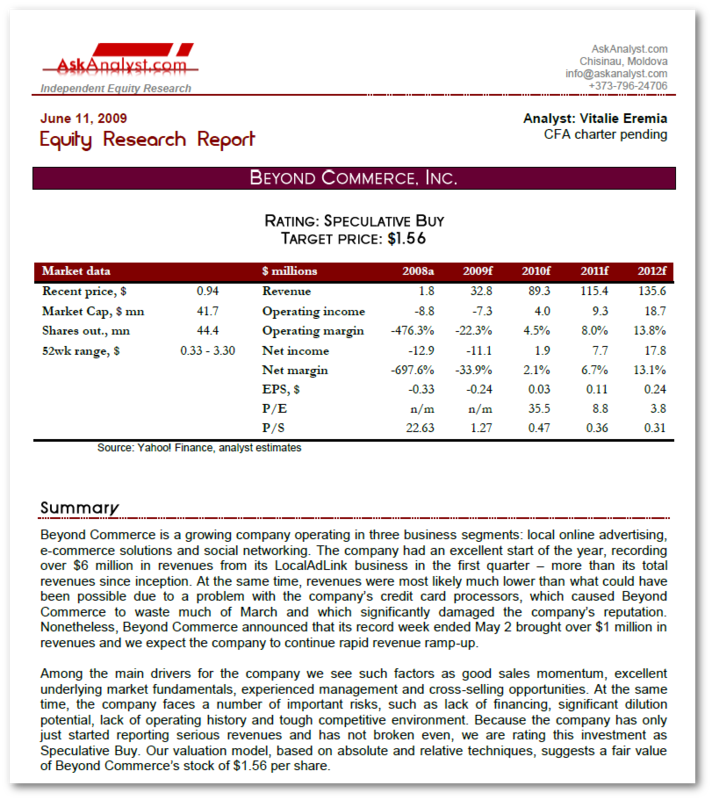 Below are several samples of our equity research and valuation work (virtually all of our work is our customers’ property, so we can’t show them all to you). 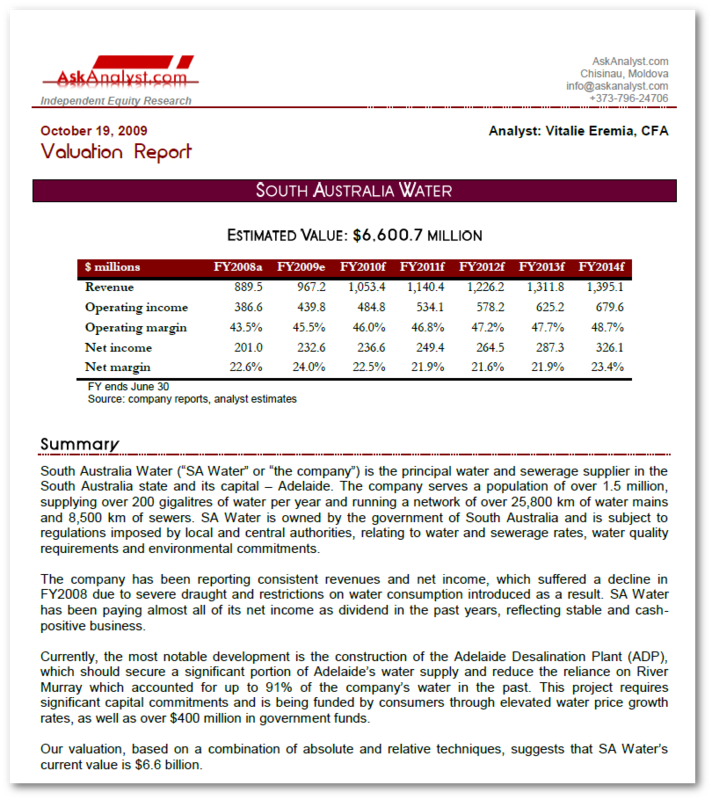 Please note, equity research report samples are just that – samples, while our typical equity research reports have more content, spanning 20-30 pages, have more detail and include DCF models, company overview, SWOT tables etc. AskAnalyst is a small team of financial analysts passionate about equity research, financial analysis and valuation. We believe that financial analysis must be based on facts, solid logic, and common sense. At the same time, we believe it is an art, reflecting not only an analyst’s experience, but often personal beliefs and imagination. If we don’t know something, we look for an answer; and if we can’t find an answer that would make sense to us, we openly say so. We believe in open communication with our customers. We do not over-promise, and we certainly do not under-deliver. We enjoy what we do and believe this love translates into the high quality of our work. Oxana Sutreac joined AskAnalyst in early 2010. 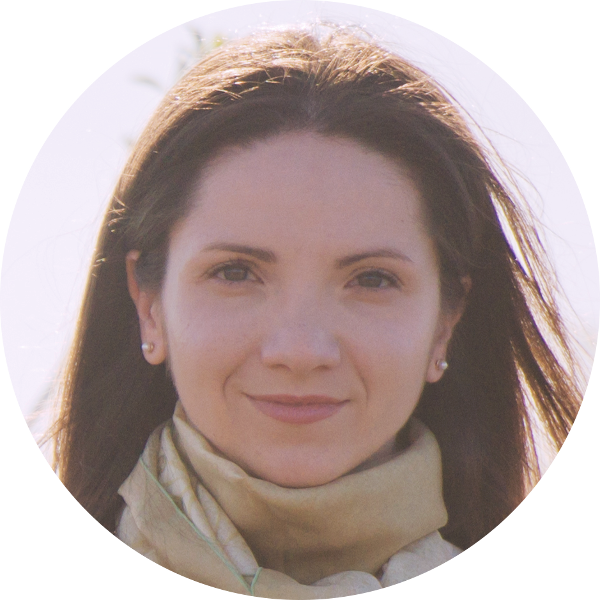 Prior to AskAnalyst, Oxana was an auditor with a Big Four audit company. Oxana is a self-motivated, result-oriented and open-minded person. Since 2006, Oxana regularly participates in local intellectual game competitions. Oxana has passed the Level 1 Exam in the CFA Program. 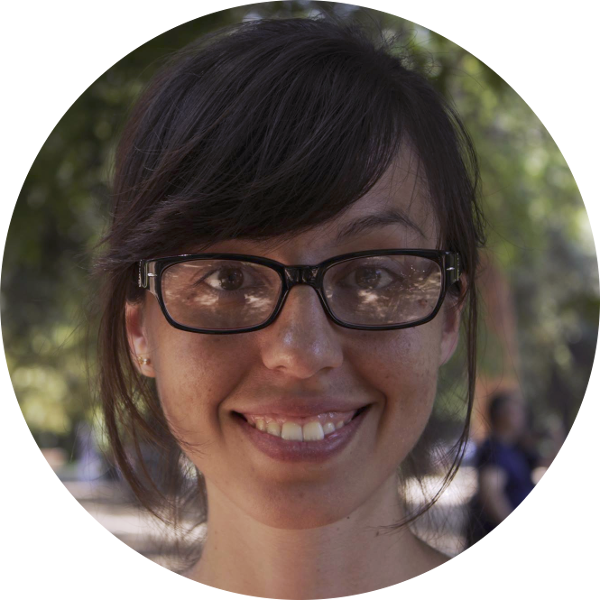 Elena joined AskAnalyst in 2015. Prior to AskAnalyst, she worked as an accountant with Counterpart International for two community development programs in Moldova and Georgia. Elena is an ambitious and open-minded person, with a great interest in different cultures. She is an alumni of several international scholarships, including Theodor Heuss Kolleg in Germany and Confucius Institute in China. In 2012 she gained the Level 5 in the HSK Chinese Proficiency Test. 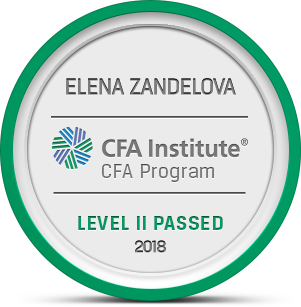 Elena is a Level 3 candidate in the CFA Program. 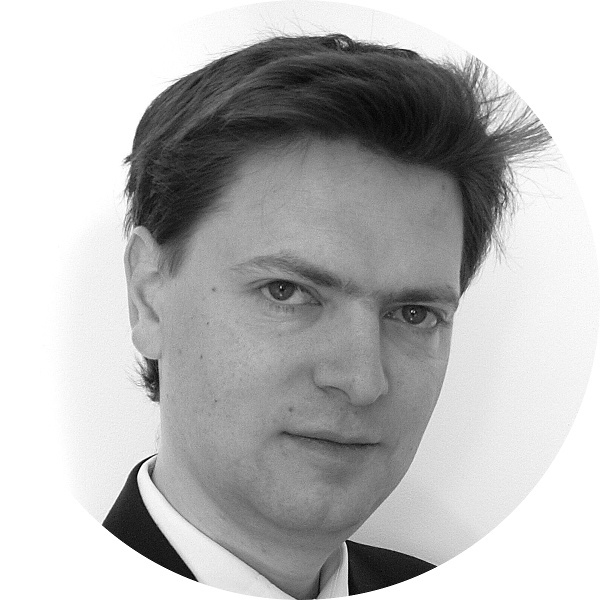 Vitalie is our founder, Head of Research and senior analyst. 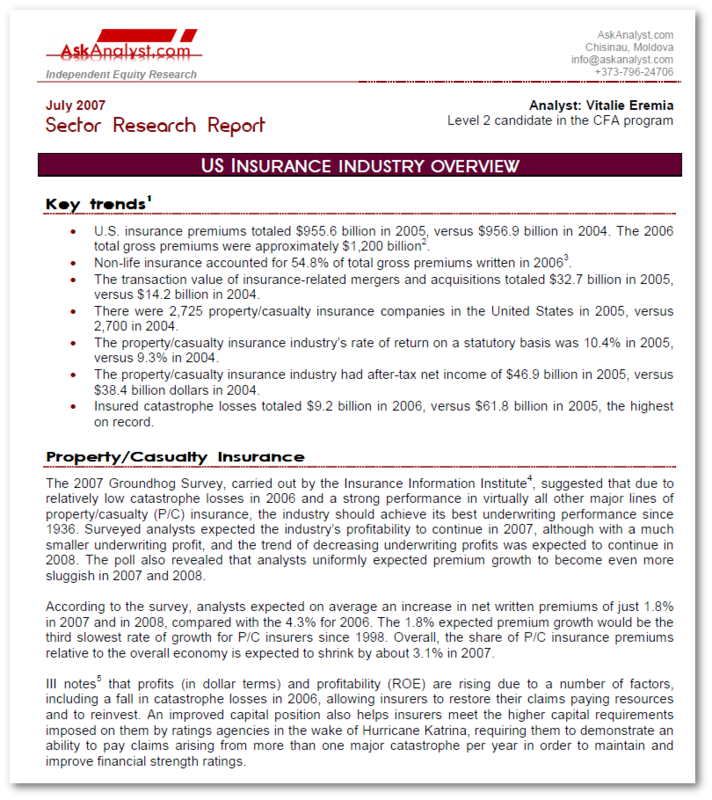 Vitalie has a strong background in financial modelling and industry research. He began his career in finance while studying in university, devoting most of his time to a demanding job in a leading microfinance institution, where in a short time he progressed from project assistant to accountant. His excellent command of English language comes from two years of studies in the UK. 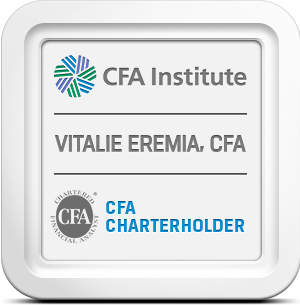 Vitalie is a regular member of the CFA Institute. We always welcome interest from Moldova-based professionals and even students or graduates aspiring to become professional equity research analysts. If you live in Moldova and are interested in joining our team, by all means get in touch with us. If you’re not based in Moldova, unfortunately we have no possibility of hiring you at this time.